The Sauropod Dinosaur Camarasaurus - cool. With its unlikely (un-Sauropod-like) boxish head and with an apparent ability to reproduce like bunny rabbits the Camarasaurus was, if not the largest, then certainly the most numerous member of the North American Sauropod Dinosaur family. 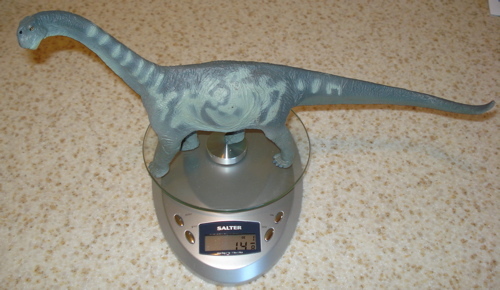 The Carnegie Collection Camarasaurus, introduced in 2001, is a large fourteen (and one eighth) ounce (14.125 oz, 401 gms) and seventeen inch (17", 42.7 cms) long 1/42 scale model of what was one of the primary items on the Late Jurassic Period Buffet menu. Living in great herds (Below) these sixty-foot (60') long, twenty ton (20 ton) behemoths found safety in numbers. (Below)"Mmmm, mmmm, mmmm, a salad bar." (Above)"Hmmm, what's in that bowl?" feel pretty secure in their numbers. 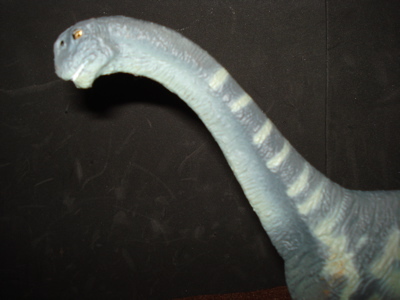 Unlike most other Sauropod Dinosaur the Camarasaurus have both relatively short necks and tails, with large heads. 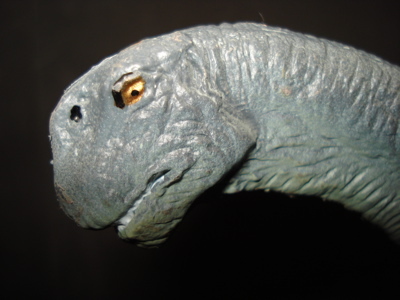 The Camarasaurus' head was used initially and mistakenly (opens new window) on the neck of the earliest Apatosaurus (Brontosaurus) fossils. A great face! 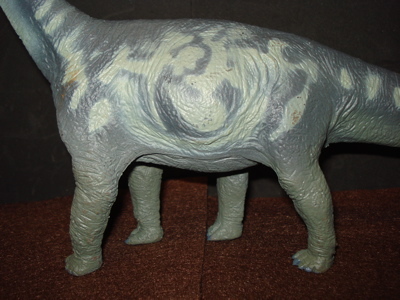 The nostrils clearly placed high up on the skull. A somewhat angry look in profile, almost as if it is gritting its teeth, from the the front it bears a much sweeter and gentle countenance. expected "Carnegie" is missing! 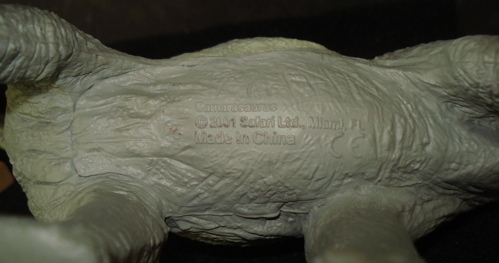 And the belly-bottom appears to be a separately molded piece from the rest of the figure. 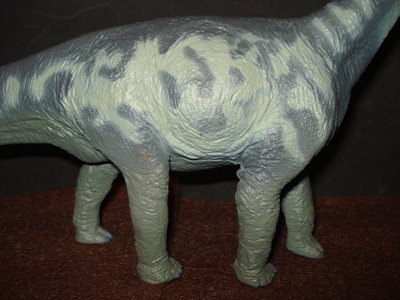 This can also be seen in a very close examination of the Carnegie Apatosaurus and new Diplodocus where it is not nearly as obvious (requiring actual close study to find) and may be a factor in the manufacture of these larger Carnegie figures. While easily seen it is only noticeable actually looking at the belly of the beastie. 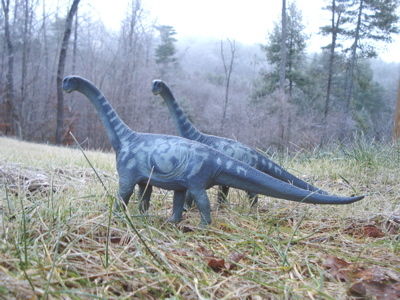 Sometimes it is safer for Carnegie Camarasaurus to hang out outside (Right) and just take their chances in the great outdoors than it is is to hang around inside where the density of predatoys is much greater. 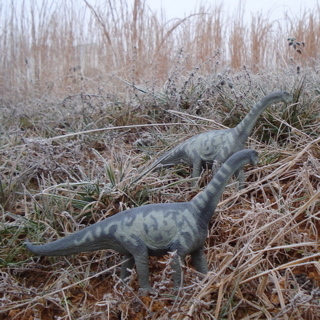 Although all things taken into consideration it can get pretty thick out in the real sauropod dinosaur world and not being climate controlled (no global warming in the real world) coming back inside to the man-made climate controlled world has its advantages. (Above)"It's cold! Our feet are wet! We wanna come inside!" (Below)Aaaah, this is much better." Cutting out and assaulting a likely lunch. Meanwhile the rest of the herd considers calling the authorities but no one has a cell phone or knows the emergency number. 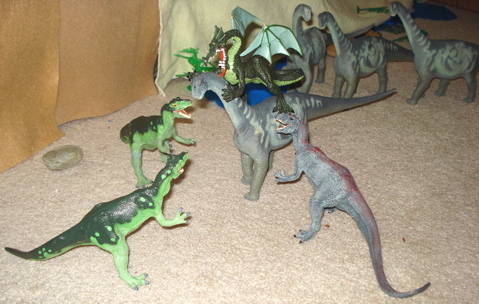 Sometimes herds are no help at all. 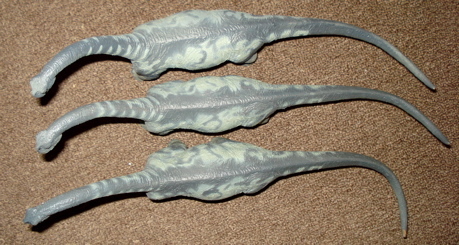 (Above) Front Feet- left. 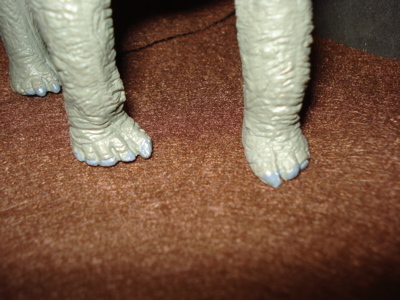 Rear Feet- right. With the little toe nails painted a light blue, not so much contrasting with but more complementing the gray of the body and the metallic bronze eyes. 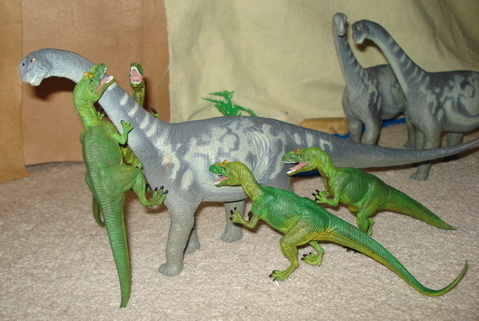 In a sense the Camarasaurus had been done previously in the MARX Brontosaurus. 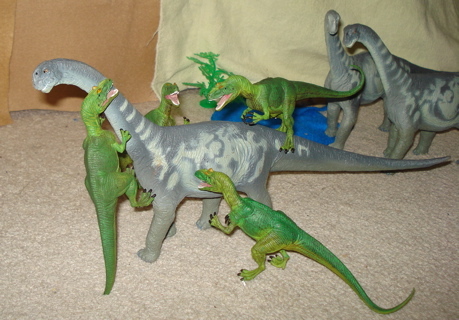 The reality though is that this Carnegie Collection (opens new window) Camarasaurus is a unique Sauropod Dinosaur toys offering and if you want one, The Carnegie Collection is the only place to get one. They are selling for anywhere from $12.99 to $29.95 (don't forget to add taxes/shipping) with a recommended price of $21.99. 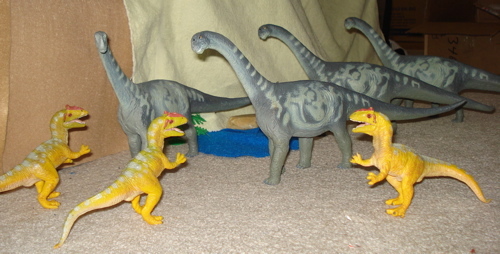 They can be found both online and in local Dinosaur toy stores. Anyplace that carries the Safari/Carnegie line. 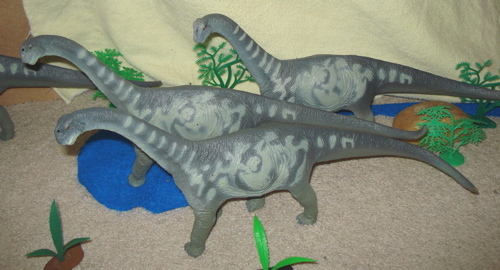 I would like to take this moment out of time to thank the nice people at Safari Ltd. (opens new window) for supplying the Camarasaurus Sauropod Dinosaur toys used for the creation of this page. 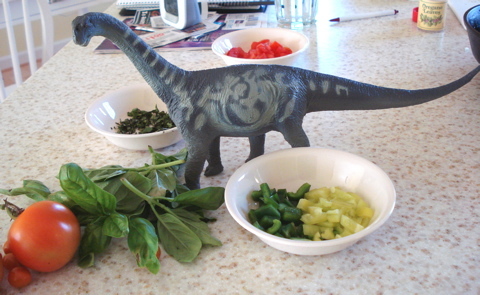 As was seen on the Cam's belly the Euro-Union's stamp of non-toxicity, the "CE" tells us that this Sauropod Dinosaur is non-toxic, if inedible and the U.S. government CPSC now requires everything be tested (though not sauteed) as well. But these are too nice to gnaw on. They have been on the market now since 2001 and do seem to be holding their own. While a tad pricey to create an entire herd their size alone does make them somewhat intimidating to most would-be predatoys. Buy one and it will last a lifetime. 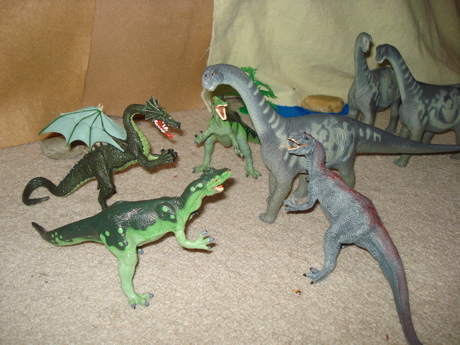 For anyone seeking a complete Dinosaur toys collection it is a must. I would suspect that years in production will not serve it in the sense of becoming a "collectible" but it certainly is a popular figure. Otherwise it would have been retired by now. 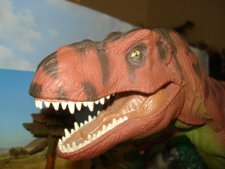 You can use this site-search box to find everything you need about Dinosaur toys collecting. 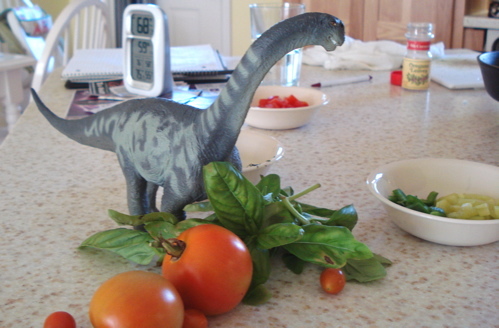 Can't remember everywhere we mentioned, say, Velociraptors or Sauropod Dinosaur? Just put in your search term and you'll get a listing of everyplace on our site where you can find what you are particularly interested in. 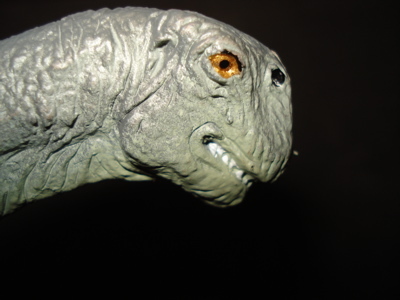 You have been reading the Camarasaurus Sauropod Dinosaur page. 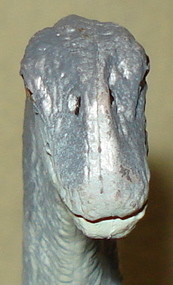 Click here to return to our main Sauropods page.